The No. 19 Oregon Ducks (3-1) and the No. 24 California Golden Bears (3-0) pair up this Saturday in Berkeley, Calif. Here are five things to watch for in this showdown of Pac-12 north division foes. This will be the Ducks’ first time playing a road game this season as they travel to take on the Bears. They hope to be more successful than last year and in previous years where they have struggled when going away from Autzen Stadium in Eugene with an abysmal 2-9 record. Winning football games on Saturday is what every team in the nation sets out to do. California has done nothing but win this year with a record of 3-0. In their first two games, the Golden Bears snuck by the North Carolina Tar Heels and the BYU Cougars by an average score of five points. Last week they began to click as a unit, beating the Idaho State Bengals by 22 points. The balanced attack last week was key to victory as California went for 232 yards on the ground and 269 yards through the air. The rushing attack was spearheaded by both Marcel Dancy and Chase Gabers. Gabers also added three passing touchdowns in the game. Oregon is known for pouring rain on anyone who comes to the state with an average of nearly four feet of rain per year. The Ducks share this connection in the state they play as they have scored 186 points this year in four games, which puts them at 13th in the FBS in scoring offense. 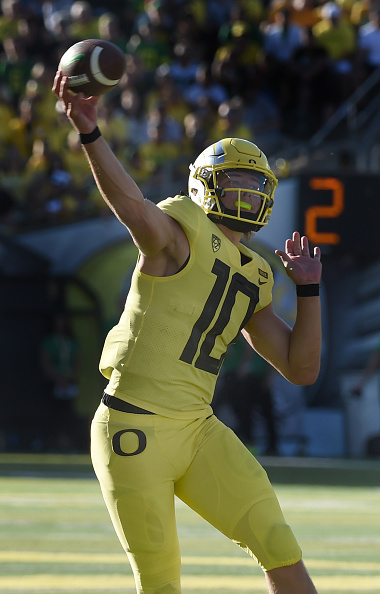 The downpour of offensive thunderstorms has been led with the lighting arm of quarterback Justin Herbert. The junior has amassed 1186 yards passing and 13 touchdowns this season. The Bears in recent years have not been on the winning side of the box score against the Ducks as they have lost eight of their last nine meetings. The low point came on Sept. 26, 2009 in a 42-3 loss, which saw the Bears accumulate a smudge over 200 yards of total offense. Quarterbacks, linebackers, running backs and defensive backs are all important. Oregon’s skilled players have shown the ability to move up the field with ease. California’s tough and aggressive defense has been doing quite the job of slowing down the opponent. Where is the battle won? The trenches, yes the trenches. This is where the biggest men on the field battle it out in a gladiator type of combat. A combat which would make Russell Crowe chant, “Spaniard, Spaniard, Spaniard”. Oregon’s offensive line has three preseason award candidates— Calvin Throckmorton, Jake Hanson and Shane Lemieux. Lemieux is the pounding guard who crushes defenders on runs. Hanson is the masterful conductor of the orchestra keeping everyone on tempo. While Throckmorton is like a good pick-up truck for every occasion. California’s defense anchors everything up front with tenured group of upperclassmen who are heavy, strong and quick. Chris Palmer plays the tough nose guard position, two-gapping at times and stopping plays before they even start. Junior Zeandae Johnson and Luc Bequette are rushing the edge while protecting the run.